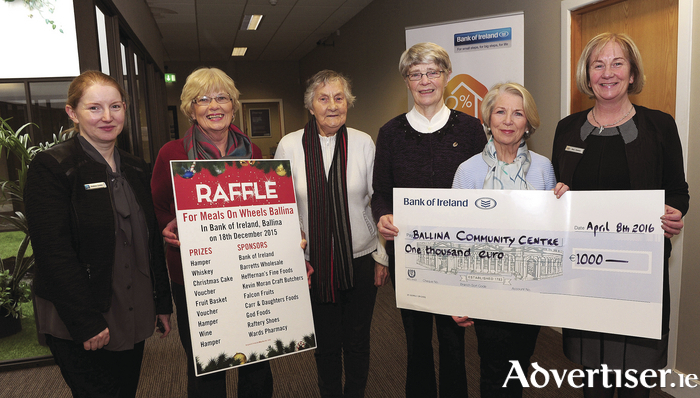 At the presentation of a €1,000 cheque the funds of which were raised recently in the Bank of Ireland Branch, Ballina, were members of Ballina Community Centre Committee, Ann Murray, Nan Healy, Sr Martha, and Olive O'Donnell, accepting the cheque from Mary Doherty (manager, Bank of Ireland, Ballina). Also included is Siobhan Conlon (Bank of Ireland, Ballina). Photo: David Farrell Photography. Greg Kelly who is a guide on the Croagh Patrick Heritage Trail will be leading a heritage tour of Clew Bay every Tuesday over this summer season. The tours are part of Slainte Ireland tour company's summer programme. The tours begin and end in Westport and are also available in German by qualified native German speaker Constanze Dittmar. You will discover Iron Age ring forts, monastic sites, and megalithic tombs. This tour is guided by a qualified tour guide with a degree in Irish heritage studies and will offer a window into the ancient past. The tours will depart Mill Street car park in Westport on Tuesdays at 5pm from May to September, the maximum number on each tour is 12 and it costs €50 per person including transport and tour guide, and the tour takes five hours to complete. Pre-booking and confirmation is required the evening before by 8pm. For more information call (087 ) 6393307. A healing service with Eddie Stones (Emmanuel House Of Providence in Clonfert ) will take place on this Saturday (May 14 ) in Gortnor Abbey in Crossmolina. The Sacrament of Reconciliation and healing prayer, the rosary and a talk starts at 2pm. It will be followed by mass at 3.30pm. All are welcome to come and be blessed. The May meeting of Mayo Organic Group will take place at Westport Woods Hotel, Quay Road (on the right as you drive out towards the Quay ), on Thursday May 19 at 8pm. There will be a gardeners and organics question time on the evening with a panel of three to four. If you have some questions prepared in advance, that would be much appreciated by panel members - so they can, if necessary, do some research - but there will the opportunity to bring other questions on the night. Any problems with pests, persistent weeds, or any queries about organic food or issues are welcome. Refreshments and networking will follow the meeting. Further information from Cleo by emailing [email protected] or by calling (085 ) 1754916. All are welcome to this open event, so please pass on the word. The third annual Spirit of Knock 5k road-race/jog/walk, will take place on Saturday May 21 at 11am from Knock Community Centre. This event takes place through Knock village with routes around the grounds of Knock Shrine and Basilica. The course is officially measured with an Athletics Ireland permit granted. Chip timing will be used on the day. There will be cash prizes for the top three finishers in both the gents' and ladies' section and refreshments will be served after the race at the prize giving. All proceeds go towards Knock National School. Entry costs €10 for adults, €5 for students, and €20 for a family. For more information contact (086 ) 2938216. Liam Lawton will be in concert in Ballintubbter Abbey on Friday July 29, tickets are now available from Ballintubber Abbey Office and Downtown Records in Castlebar and Westport. Tickets cost €25, for more information call (094 ) 9030934. Erris Agricultural Show invites individuals/families to sponsor a class/classes in its 2016 show. The cost of sponsoring a class ranges from €10 - €120 per class. If you are interested in sponsoring a class contact (087 ) 3541607 or any committee member. Deadline for sponsorship of classes is Friday May 27. The show committee would like to thank all who sponsor the show every year and for their continued support. The sixth annual show takes place on Sunday July 24. The St Angela's NS Castlebar IT Fund will be holding a table quiz in Bosh, Castlebar, on Thursday May 26 at 9pm. Teams of four €40. Swinford VTOS is hosting an open day on Thursday May 19 from 11am to 2pm for unemployed adults who may be interested in doing a computer and business course commencing in September 2016 at the Further Education Centre, Swinford. The course which leads to QQI awards at levels 4, 5 and 6 provides unemployed adults with the opportunity of returning to education, updating their skills, and improving their employment prospects. The courses are free and adults who are over 21 and in receipt of social welfare for at least six months are eligible. Participants aged 25 and under may be entitled to an additional €60 per week. Childcare support is also available. For further information contact Emer at (094 ) 9251928 or email [email protected]. The Football Association of Ireland is holding a Kick Start 1 Coach Education Course in Manulla FC on Saturday June 11 from 9am to 5.30pm. Participants must attend all modules of the course in order to qualify for certification. This course is designed to assist beginner coaches, parents, and teachers introduce young children (six to nine ) to fundamental warm up activities, basic activities, and fun games in a safe, structured, and stimulating environment. Course fee is €45. This course is limited to 24 participants so book early to avoid disappointment. For more information contact Paul Byrne (086 ) 8579678 or [email protected].